Nick Russo’s album, “ro”, is an eclectic mix of straight-ahead swing, Indian Raga, modern jazz and free playing. 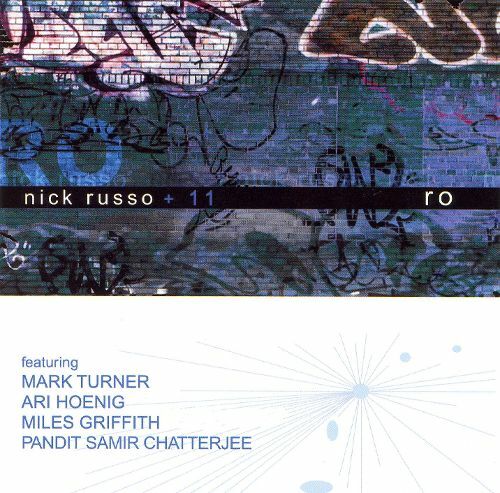 The group, “Nick Russo + 11”, features Nick Russo with various combinations of eleven great musicians: Mark Turner, Miles Griffith, Samir Chatterjee, Ari Hoenig, Willard Dyson, David Pleasant, Art Hirahara, Bryan Murray, Greg Glassman, Matt Clohesy and Nathan Peck. With varied tastes in the field of modern jazz, guitarist Nick Russo covers a wide range. He loves to interject sensual themes into his work, portraying a romantic vision as well as a consonant landscape that both rest on pleasurable experiences. They're Russo's compositions, and they represent deep feelings. Miles Griffith sings on three selections, providing unique wordless passages as well as original lyrics. He makes a suitable musical partner for Russo, since they share an appreciation for smooth scenery and spontaneity. Tenor saxophonist Mark Turner, who sits in on four selections, provides a matching tone that glows eloquently. Pianist Art Hirahara provides a stable foundation for the guitarist, while several guests give the album a unique quality. "Mitzvah" includes lyrics that run in unison with tenor saxophone. Along with tabla and a standard rhythm section, Griffith jumps out with an outstanding vocal tirade. Emotions fly in all directions, giving the piece an evocative, thrilling luster. Russo serves as the session's glue, holding its varied elements together with his expressive guitar. For the most part, he enjoys a warm composure that allows him to interpret melodies in a casual and laid-back fashion. Russo keeps his soloing simple enough, preferring to emphasize melody over technique. Thus, his second recording session as leader brings plenty of variety into the arena from his sidemen and guests, while allowing him to lead with a conservative formula. "Nick Russo's music has dozens of dimensions, his guitar threading through them all to tie together an inviting intriguing, beguiling sound world." "Nick Russo's music has the ingredients to satisfy both the fans of Mike Pingitore AND Sanjoy Bandopadhyay." "Nick is a complete musician, a fine guitarist, composer, producer and band leader. The pairing of instruments is impressive. This is the kind of CD you listen to over and over again. I highly recommend it. "Nick Russo's CD 'Ro' is marvelous! I think the guitar playing is terrific. I am very impressed! I am also impressed with the variety of the record. The music is unique and it's something that's needed in general because so many jazz records sound similar. I love the Indian Raga and the banjo playing, it was very different!" "A beautiful CD! Nick Russo shows a highly personalized concept and musicianship and the highest caliber. This project demonstrates his great range and scope as both a composer and instrumentalist." "The music on this album is universally wide and should appeal to all audiences. Nick Russo is definitely musically ready to be heard."